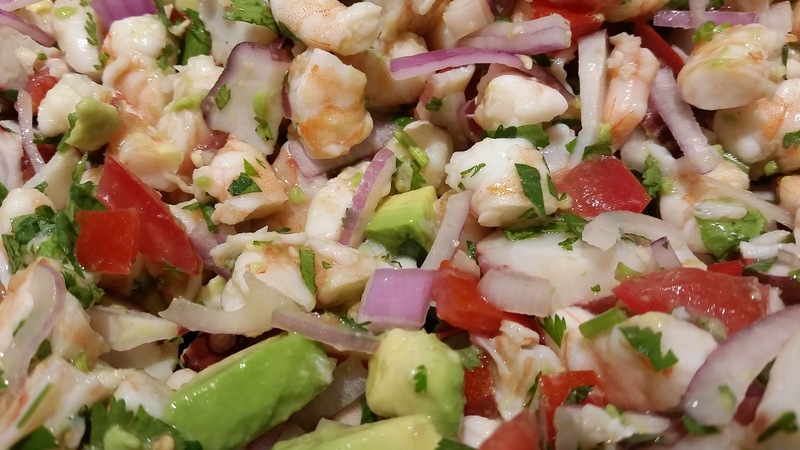 It’s a great time of year to make ceviche. All of the ingredients are at peak freshness and flavor. Few things are more refreshing than a bright bowl of ceviche and some fresh-made corn chips to scoop it up. Ceviche is one of those dishes that I crave every so often. It has many variations, so the flavors can be modified to suit availability of ingredients or desired taste. Usually my choice of the seafood sets the tone for the final dish. Today I made a ceviche with small Gulf shrimp and octopus tentacles. This batch makes about a gallon of ceviche. Enough for a crowd, or to have on hand to munch over a few days. Wash, peel, and devein the shrimp. Fill a pot large enough to easily hold the shrimp halfway with water. Add the juice of one lime and a teaspoon of salt. Bring to a boil. Prepare a large bowl with ice water. Put the shrimp in the boiling pot for a minute, drain and put them into the ice bath. Once cool, cut each shrimp into 2-3 pieces (small enough to scoop up with a corn chip) and place in a one gallon acid proof container with the cup of lime juice. I purchased octopus that was already steamed at a place where they sell fish for sushi. If you have a fresh octopus, you may poach it in the same liquid as the shrimp, and remove when it is just barely cooked through. Too long and it will be rubber! Thinly slices the octopus into small pieces that are scoopable with a chip. Place the octopus in the container with the shrimp. Refrigerate for at least an hour. Remove from fridge and place the seafood in a large stainless bowl. Fold in the remaining ingredients. Note: I left the habanero out to add at serving time so each person can jazz up the heat to their liking. I tend to like mine spicier than others do. Taste and add more salt as needed. Remember that your chips will have salt, so err on under salting. To make the chips, cut corn tortillas into ¼ or 1/8 wedges, and deep fry in oil until they are browned and crisp. Drain each fryer basket over the fryer until they appear dry, then toss into a large bowl lined with paper towels. Sprinkle with coarse sea salt. Repeat until you have enough chips. This looks lovely and is inviting me to make it.